Latte: Ben's still working on the Java socks. He plans to go to Canvasworks or the Acorn Street Shop to get yarn for a sweater. Abby's knitting the Adrian vest from Cocoknits. She is using yarn she bought at the first sock summit from Briar Rose Fibers. Grande: Abby finished Shalder -- all but the buttons. Abby bought a Will Taylor Clever Kate from Carolina Homespun. Abby bought lots of fiber from Klaus of Crown Mountain Farms. Abby took a class in spinning paper with Judith Mackenzie. Abby bought a Jenkins Turkish Spindle, larger than her other one. In Portland, Abby had a yummy meal at the Waffle Window. Ben got a skein of his first spun yarn and had a great time using the Hansen Mini Spinner. Barista's Special: Elizabeth Doherty of Blue Bee Studio introduces us to our new Knitalong! Ebbtide is a beautiful shawl. Elizabeth used two yarns for the two sizes of shawls: Skinny Bugga from Sanguine Gryphon (now closed) and a Silk/Wool yarn from Dog Eared Dyeworks. For the next two weeks, listeners can get a 20% discount on the pattern. Listen to the podcast for the discount code and come join us! See Elizabeth's other designs here. Ben is excited about David Graeber's book Debt: the first 5000 Years. Announcement: For the foreseeable future, the podcast will be broadcast every other week. When Ben and Abby's schedules allow, they will return to a weekly format. Nichs joined Abby and Ben for this episode. Latte: Ben is knitting Borough Mittens, but without the flip tops. Nichs is knitting cabled socks out of Tosh Merino, worsted weight. Abby's reworking the Lucky 13 hat to make one that is not felted. She's continuing with the Dahlia cardigan. Nichs finished her Daybreak, which she knit from Happy Feet yarn. While knitting it, she discovered combination knitting, which made her stockinette much more even. Abby's working on Julia Mueller's gloves Eddy and Meisi. She tried using Malabrigo sock yarn, but switched to Dream in Color Smooshy. Caffeinated: Nichs and Ben are excited about Bonjour Cupcake in Olympia and suggest it's worth a trip, especially for the salted caramel flavor. 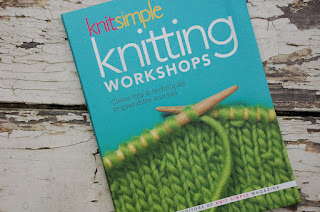 Abby reviewed Knit Simple Knitting Workshops. Tip Jar: Ben suggests buying firewood when you can. (Olympia had a great, atypical snowstorm.) Abby extols the virtues of Goo Gone.